Ever have cake without frosting? It’s just not the same. 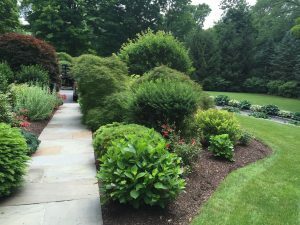 The same can be said about mulch – a yard without mulch is okay, but a coating of fresh mulch to flower and shrub beds really makes a difference. At Mike Lynch Enterprises, we provide the best top quality bark mulch around. Like frosting on a cake adds that finished look to baked goods, our mulch provides that finished appeal that tops off your yard. Mulch enhances your home, your shrubbery, and flower gardens. Mulch makes your yard look manicured and at the same time keeps weeds down while providing a sunshield and moisture barrier for your plantings. Greens look greener, flower colors look brighter. Another side benefit is that quality bark mulch like you’ll find at Mike Lynch Enterprises provides a simple, fast, and inexpensive way to make your landscaping even more attractive, adding 7 to 14 percent to your home’s value. It even acts as a passive fertilizer, slowly releasing nutrients into the soil as it breaks down. Get a jump on the warm weather and spruce up your yard by ordering your bark mulch today from the area’s leading bark mulch supplier. At Mike Lynch Enterprises your call is answered by a team of landscape professionals, experienced in a wide range of landscaping materials, products, and services. No automated system here — like our mulch, we’re the real deal. Calls are immediately dispatched and your mulch is leaving our yard and off to yours.